Roberto Salas is one of the 10 artists to receive San Diego Foundation’s 2015 Creative Catalyst Grant. Salas is sponsored by and is partnering with Camarada, a non-profit chamber music ensemble, to heighten the awareness about the plight of the honeybees in our community. 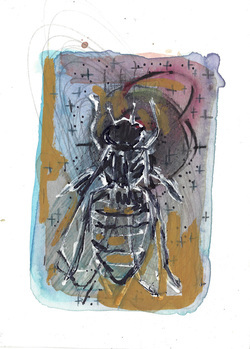 The first phase of this Creative Catalyst Project begins with this Plight of the Honeybee exhibit, which presents Salas’ studies and sketches of honeybees. For more info visit http://beeprojectblog.tumblr.com.